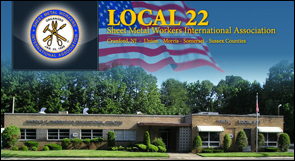 Welcome to the redesigned website for Sheet Metal Workers Local 22. This is an exciting development for the members and visitors of this website because it is now mobile responsive which means that you will now be able to read the text more easily on your smart phone and tablets. We encourage you to visit the site often as we'll continue to add new content on a regular basis. Thank you from the leadership of Sheet Metal Workers Local 22.